The G.fast roll-out is given an increasing number of people their first ultrafast broadband option though for many it is an alternative to Virgin Media cable services. Openreach in the last set of BT financial results declared a total ultrafast footprint of just shy of 2 million premises (close enough that most headline writers rounded up to 2 million) and our tracking currently has a footprint of 1,730,422 so around a quarter of a million shy. The split between the two technologies is that the golden child that is full fibre is running at 627,011 premises and the not so popular with politicians G.fast is at 1,103,411 premises passed with access to 100 Mbps or faster. The latest G.fast pods added to our map include half a dozen on the Hackney exchange, joining a much larger deployment on the Stratford exchange. In total we know of 3,785 live pods across the UK, so running at an average of 291 premises per cabinet within reach for a faster than 100 Mbps service. The FTTP roll-out is where the future lies and while we are spotting a lot more each week compared to a year ago, the pace still needs to rise significantly to meet deadlines. What we are observing is a lot more people on social media talking about seeing the infrastructure close to their home, but the service not ready to order yet, which suggests Openreach may have built more than we are seeing but the ready to order flag has not been flipped for some reason yet e.g. waiting on upgrades to give higher capacity backhaul handover at exchanges, or the fibre run from the manifold outside homes to the aggregation node is not complete. There are also times when the online order checkers may actually be wrong, as we do occasionally see on new build estates people with a clearly FTTP based service speed testing but all the order systems still say no - we suspect that some dogged persistance on the phone has allowed these people to order. All this along with the time it takes us to spot the FTTP explains why we are at 627,011 premises versus the Openreach declared 682,000 figure of a couple of weeks ago. What we can say on the FTTP roll-outs is that we are seeing more FTTP overlay especially in Northern Ireland, but there is also evidence of BDUK projects using FTTP to bring those too far from the VDSL2 cabinet into the world of superfast broadband. 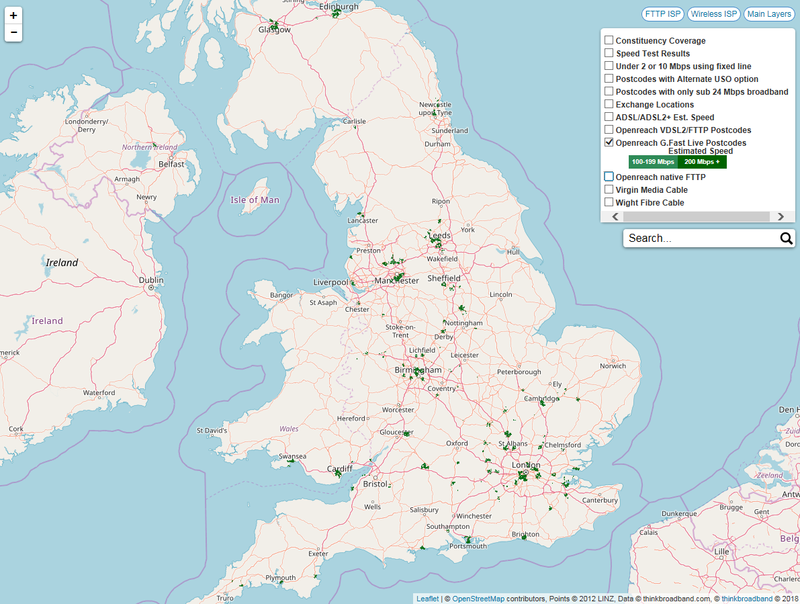 In terms of the Openreach Fibre First programme it takes a while to get up and running in the various areas and generally the first signs are Exchange Only (EO) line areas getting upgraded, followed by the first VDSL2 cabinet getting a partial overlay of FTTP. Given G.fast is likely to be replaced by FTTP in five to ten years time or overbuilt with FTTP by a competitor to Openreach tracking the footprint closely is important as those premises with access to G.fast are not going to be getting FTTP from Openreach in the short to medium term for sure. With the multiple roll-outs of FTTP, Gfast, DOCSIS, RFOG and still some VDSL2 the monitoring of what is being delivered is actually busier than in any of the previous years. One observation that is not a long term trend just yet but has gone on long enough to be worth pointing out, the number of VDSL2 cabinets being rolled out has slowed down again it seems, the previous big drop happened at the end of 2017 but we may have just had another cliff edge moment, as things stand today we are often finding more Openreach FTTP each week than new VDSL2 premises. As always the maps are a little behind the postcode availability checker system that drives our package search, the postcodes we update daily but the many map layers are changed over the course of each month, with the pace of the G.fast and Openreach FTTP roll-outs those layers are usually updated weekly. And what will happen with households like ours? We recently saw the rollout of Virgin Media Project lightning in Ayr, and just about every street apart from us were cabled. After pursuing this for months with them, they have returned to say the cost of cabling our monoblock roadway outweighs the return they would see. Left on FTTC, with only a couple of properties in the street able to acheive over 40Mbps, due to line length to cabinet. Will we see an improvement in the next 5-10 years, or will we wait much longer? My kids will be at college by then, and these speeds won't be enough. Similarly to Spitfire400, but with a different technology, I'm in a place (Brighton) that counts as a G.fast area, but my cabinet (cabinet 56, Brighton Withdean exchange) is podless. What's the logic regarding which cabinets get G.fast and which don't? Most of the other cabinets in my immediate area have pods. Having a small number of active lines on a cabinet does not help, but such is the density in Brighton that there are cabinets with live pods not unlike the size of yours, but once you factor in issues around how many are then within reach you can start to get an idea. Real world answer is no-one knows who will get to which streets by which date. If one provider finds a problem with the street then others are likely to, so until someone puts fibre down or on Openreach poles you may be waiting for some years. With targets of 50% by 2025 FTTP, and 100% 2033 it is pretty clear lots of people will be waiting a long time. I don't see ours on there - but by luck I was looking at new providers and turned out I could get G.Fast - Cab 3 Radstock. I put in a few addresses along my rank and oddly there are only about 3 out of 10 houses along the road that can order it. Secretly I am a little disappointed as this means that it will be unlikely that we see a FTTH service.